Cheerful, yellow, lantern-shaped flowers with fleshy lemon peel-like petals from July to October followed by highly decorative, fluffy seedheads. This vigorous, late-flowering clematis looks lovely cascading over a sunny wall, pergola or arch. Where space is limited prune hard in February - left unpruned it can become a very large plant. Garden care: In early spring cut back the previous year's stems to a pair of strong buds about 15-20cm (6-8in) above ground-level and apply a slow-release balanced fertiliser and a mulch of well-rotted garden compost around the plant, avoiding the immediate crown. If you want a larger plant, then no pruning will be necessary apart from thinning over-crowded stems in spring. I planted this next to a drainpipe against an east-facing wall and it almost instantly exploded with shoots and dense foliage. It climbed at least 15 feet and looked lovely. However, I hardly got a flower out of it. Actually I got 2 flowers. They were very pretty, but on the other hand there were only two of them. I kept it well fed and watered, so my guess is that it needs a bit more sun than some other varieties to flower well. Who knows. Nevertheless, it's ability to completely cover an ugly bit of wall means it's earned its keep, so we'll see what it does in 2019. Lovely clematis that actually grows in my garden. Don't have much success with clematis normally but this one is happily romping away. Hardly grew in first year compared with another clem which had massive growth right next to it. Am waiting to see what happens in the second year after being pruned back. This must be one of the fastest growing and beautiful clematis around. 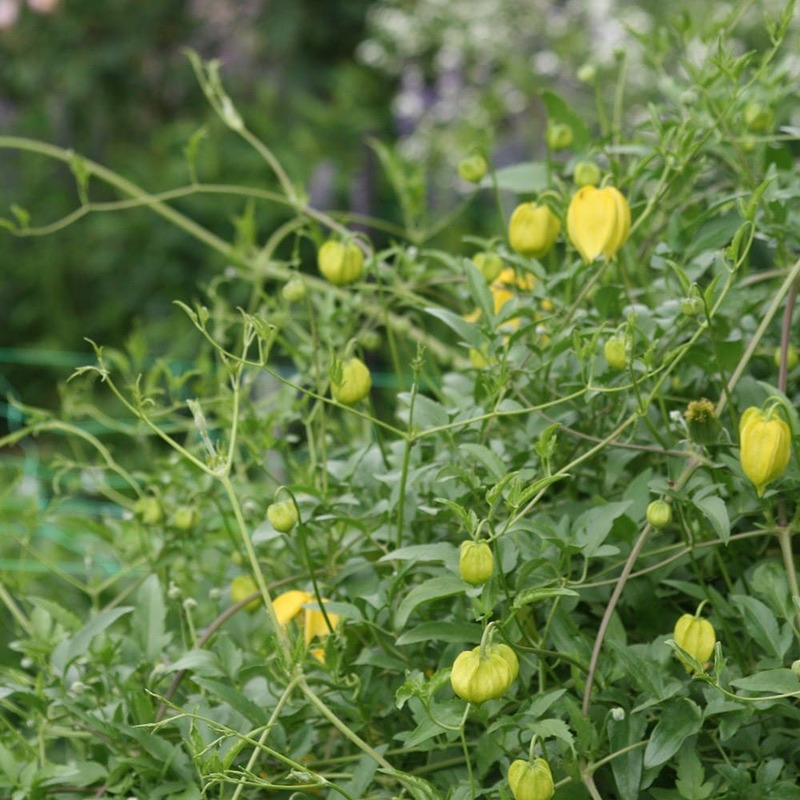 In its first season it reached over 2.5 metres and was covered in gorgeous yellow bells. As the flowers died off, the magnificent bearded seeds covered the plant, and still do, right into late winter. Excellent service, good strong plant. A very attractive clematis that flowers late and gives a welcome burst of colour as the Autumn progresses. Hello -Is this the same as Clematis tangutica Bill Mackenzie? Thanks. I have lost a clematis to wilt. I am considering replacing this with another (tangutica) planting it in the same spot. Is this safe to do? I understand that wilt does not affect the root system. Thank you. Hello, Clematis wilt is a real problem with the larger-flowered forms, but the tangutica's are not usually susceptible, so I suspect the wilt has actually been caused by a cultural problem. With this in mind, it may be worth waiting to see if the plant starts putting on new growth again, otherwise it will be fine to replace it with another. Hello Peter, I have done a search on our Plant Finder and if you click on the following link it will take you to all the climbers which will grow on a north facing aspect and are fast growing (although keep in mind most plants are going into their dormant period now) http://www.crocus.co.uk/plants/_/climbers/plcid.15/vid.186/vid.237/ I hope this helps. If you want to clothe your fences with flowers from spring to autumn but are overwhelmed by choice, then this article should help.